Council for Green Revolution (CGR) was founded in 2010 by Mr. & Mrs. Laxma Reddy, who have been working in environment preservation through various initiatives for over 25 years. CGR, in particular, propelled their outreach significantly, mainly because, for the first time, government school children were prominently factored in the program, as the main enablers for planting and nurturing tree saplings. The target in the first year was to plant 100,000 saplings, but the actual number reached 150,000, thanks to the enthusiasm of these students. Today, CGR, the only organization focusing on tree plantation in Andhra Pradesh, has enabled the planting of almost 1.8 million saplings, and now has a target of reaching 10 million trees in the near future. 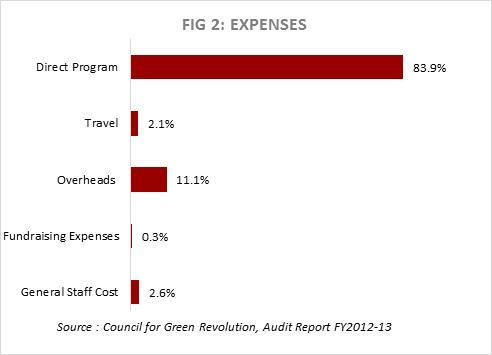 Spend on Programs vs. Overheads: CGR’s expenditure on direct program related activities, i.e. awareness camps, tree plantation, etc. amounted to almost 84% of total expenses, while overheads amounted to 11.1% (Ref: Fig.2) An indication of an expansion of program activities is the over 200% increase in program-related expenditure in FY13 (Rs3.6mn) as compared to FY12 (Rs1.1mn). Surplus and General Reserves: CGR so far spends almost entirely what it raises; the surplus for FY13 was Rs0.03mn which is around 0.7% of the total income for the year. Similarly, the carried forward surplus of FY12 stood at around 0.9% of the total funds raised. General Reserves amounted to Rs0.1mn as at FY13 year-end, which raises concerns about the sustainability of the scale of the program in the event the quantum of funding reduces in the coming years. 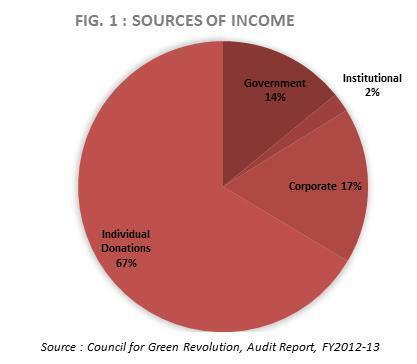 Income Growth Rate (IGR): The IGR of CGR reached almost 106% in FY13, as compared to just 3% in FY12. This indicates that as the organization grows, so does its ability to raise funds for its programs. This ability is essential as CGR does not have any sustainable source of income to supplement that from external donors. Self Sufficiency Ratio (SSR): The SSR of an organization indicates its ability to generate funds from steady sources of income such as individual donations, investment income, beneficiary fees, etc. The SSR of CGR was at 67% in FY13 (three years average: 71%). This is directly influenced by the large dependence on individual donations, which formed 67% of the total income in FY13. Fundraising: CGR faces difficulties in mobilizing funds to support its programs. The plantation drives are conducted on a seasonal basis, and creating interest among sponsors for these drives is a major challenge. Further, CGR has not yet been able to develop a financially sustainable model for their programmes. Need for Organizational Planning: Being a new and rapidly growing program, CGR feels the need for expert planning on design and implementation of its activities in the most efficient way possible. Without this it will be difficult to scale up the program, and will add to the burden of Y-o-Y fundraising. Co-founder Mr. K. Laxma Reddy is the Founding Director of Ashoka Developers & Builders, and is an advisor to Cybercity Builders and Developers. Mrs. Reddy has been working in the social sector for several years, mainly with Vandemataram Foundation, which works for the development of rural school children, and with the Lions Club since 1989. She is also a member of the Hyderabad Mahila Vidya Sangham and the Family Planning Association of India. CGR is registered with GuideStar.